Senator JV Ejercito is seeking the Senate to probe why the Bureau of Customs and the Department of Foreign Affairs both slacked off in their duties to thoroughly inspect imported shipments and to file a diplomatic protest against Canada for its illegal offloading of hazardous waste in the country. Ejercito also slammed the Aquino administration’s indecision in swiftly resolving this controversy, causing the shipments to rot and stink at the Port of Manila since 2013. “I just find it hard to believe that the BOC was hoodwinked by Chronic Inc. (the Canadian waste company) in its declaration that all fifty shipments simply contained materials for recycling. I am sure Chronic Inc. has a ‘backer’ behind all these transactions given their audacity on this issue,” the lawmaker today said. 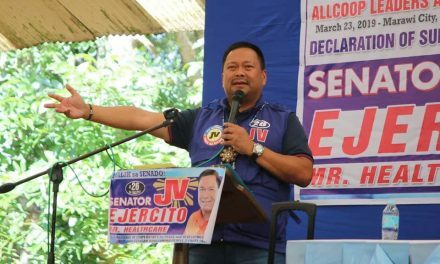 Ejercito commended Tarlac Governor Victor Yap and Vice Governor Kit Cojuangco for being alert and actively protesting against the dumping of toxic shipments in Capas, Tarlac.